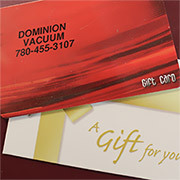 Dominion Vacuum has been doing business in the same location since 1992. For 17 years prior to that, the store was a Hoover Factory Service Center, but it has become a full sales and service center for a variety of vacuum brands and accessories and is well known for expertise in the industry. We are located in north central Edmonton with free parking right in front of the store. Click (or scroll down) for directions & contact info. We carry Cana-Vac central vacuum systems and a variety of tool sets, as well as domestic and commercial vacuums and carpet shampooers. We also have a selection of reconditioned vacuums at a substantial savings, plus bags, belts, filters, parts and accessories for almost any brand of machine. Authorized warranty service for Cana-Vac, Eureka, Samsung, Johnny Vac, Royal Dirt Devil and Hoover - also service and repair of almost any other make or model. We can repair what most others replace and have a vast knowledge of central vacuums and portables alike. We firmly believe that integrity and honesty is key to serving our customers, and we give them the full range of their options before repairing or replacing a vacuum cleaner. The Carpet Express carpet and upholstery cleaner is a self-contained shampooer using a reciprocating brush for gentle cleaning. Powerful 2 fan motor extracts water for faster drying. Comes with 10 foot hose for upholstery and stairs. Machine is cleaned and tested after every rental. Call for pricing and availability. Looking for a romantic gift? This probably isn't it. But if you're looking for a practical or useful gift, we've got you covered. Individual cards can be purchased in any denomination up to $250 and used toward any new or rebuilt product, service or parts and even central vacuum installations or service calls. Email us at domvac@shaw.ca or by using the form below.